On March 21, 2006, Twitter founder Jack Dorsey (@jack) sent the first Tweet. Since then, Twitter has amassed more than 200 million active users who create more than 400 million Tweets each day, according to Twitter. 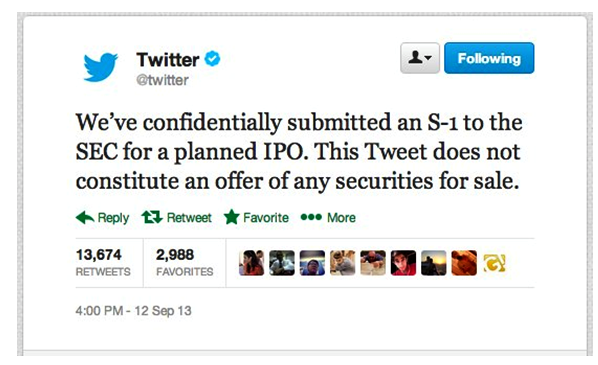 Now, after seven years of growth, Twitter said yesterday that it has submitted preliminary paperwork for an initial public offering, an announcement that recalled another major public offering by a top company in the social media realm—that of Facebook, in May 2012. The Pew Research Center has been studying online adults’ social networking site use since 2005, with its first read on Twitter as a stand-alone platform in November 2010. At that time, 8% of online adults used Twitter. 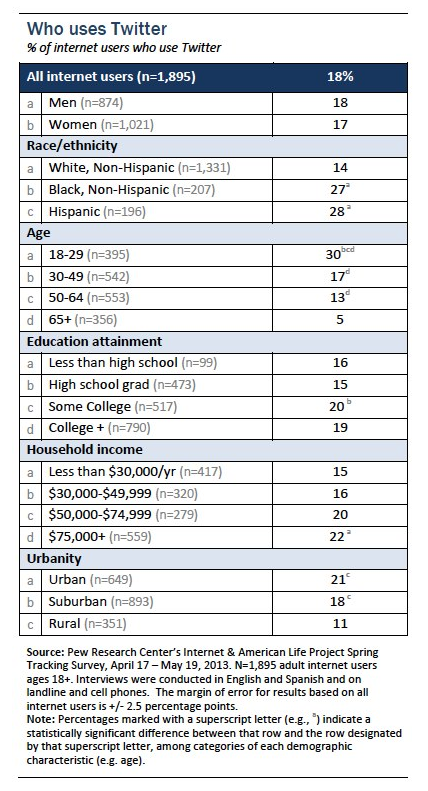 Internet users ages 18-29 were significantly more likely to use Twitter than older adults (14% vs. 6% of internet users ages 50 and older, for example). Today, the proportion of online adults who use Twitter has more than doubled since November 2010, currently standing at 18%. Internet users ages 18-29 are still the most likely age group to use Twitter—a third of online young adults (30%) now do so. Twitter use by online teens has also grown significantly, rising from 16% in July 2011 to 24% in September 2012. The rise of Twitter has paralleled the growth of mobile. As of May 2013, 91% of American adults have a cell phone, and 34% of American adults own a tablet computer. And now, for the first time, more than half (56%) of the American population owns a smartphone. The fast growth of mobile advertising on social media platforms is one factor that potentially makes companies like Twitter attractive. Twitter usage has been highly correlated with the use of mobile technologies, especially smartphones. A February 2012 survey found that one in five smartphone owners were Twitter users, with 13% using the service on a typical day. By contrast, internet users who owned more basic mobile phones at the time were roughly half as likely to use Twitter overall (9%), and just 3% did so on a typical day. Joanna Brenner is the Web Coordinator at the Pew Internet & American Life Project.